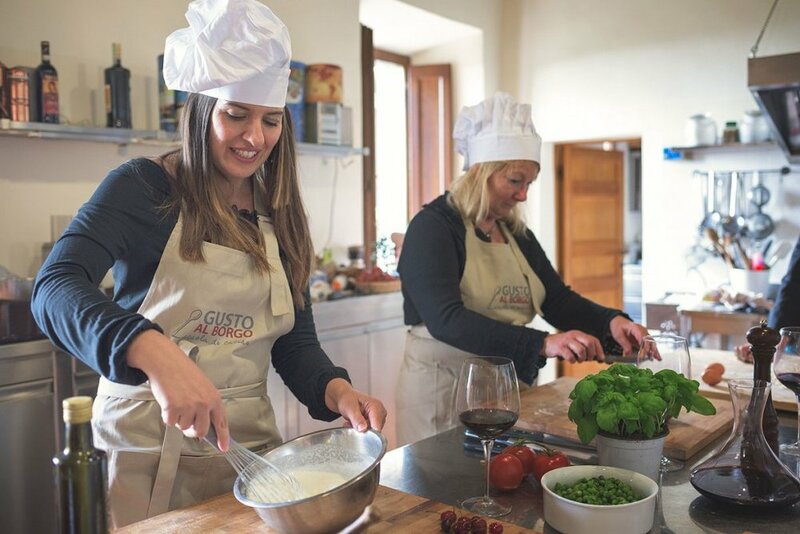 at a glance 4 night / 5 days long weekend cooking Holiday italy. Private room at our beautiful country hotel with swimming pool and gardens . TWO Italian Cooking lessons of traditional and modern Roman and Sabine cuisine. Saturday : 10.00 am After breakfast we leave for Orvieto and our Wine tasting on the Strada dei Vini. We will then spend the rest of the day here returning around 4pm. Monday : Sadly the day of departure for those leaving today. Guests are welcome to arrive any time on the Thursday and we don't throw anyone out on Monday, so you can relax on your final day and travel home stress free. at a glance. 6 night / 7 days. weeks Cooking Holiday Italy. No Single Supplement for single travellers. Private room at our beautiful country hotel with swimming pool and gardens. THREE Italian Cooking lessons of traditional and modern Roman and Sabine cuisine. Saturday : 10.00 am After breakfast we leave for Orvieto and our Wine tasting on the Strada dei Vini. We will then spend the rest of the day here returning home around 4pm. Monday : 9.30am Accompanied day in Rome . We take the train into Rome ( 35 mins ) and then the Metro to the Colosseum and we make our way to lunch near the Pantheon taking in the Jewish ghetto , Campo di Fiori and Piazza Navona . After lunch at a lovely simple Roman trattoria and after sampling the best ' gelato' in Rome your final couple of hours are free to do some world class shopping or take in more of the sights and sounds of the eternal city. Tuesday : afternoon and third and final lesson with Emiliano at L'Antico Bottega followed by dinner. Wednesday : Sadly the day of departure for those leaving today. Guests are welcome to arrive any time on the Thursday and we don't throw anyone out on Wednesday, so you can relax on your final day and travel home stress free. Travel , Flights -To / From Italy. Travel Insurance. We do ask that you are fully covered for Medical, Personal and Travel. Guests wishing to come and stay in this beautiful place but not participate on a Taste Trails Rome | cooking holiday Italy, are of course very welcome with a 10% discount. You would experience everything listed above including lunch / dinner after the lesson and the Wine tasting, just not participate in the lesson it self. And finally to remind you , there are No Single Supplements for Solo travellers. Dear Mark , I feel that I have one foot back in France and the other in Sabina. It really was one of the best holidays that I have ever been on. 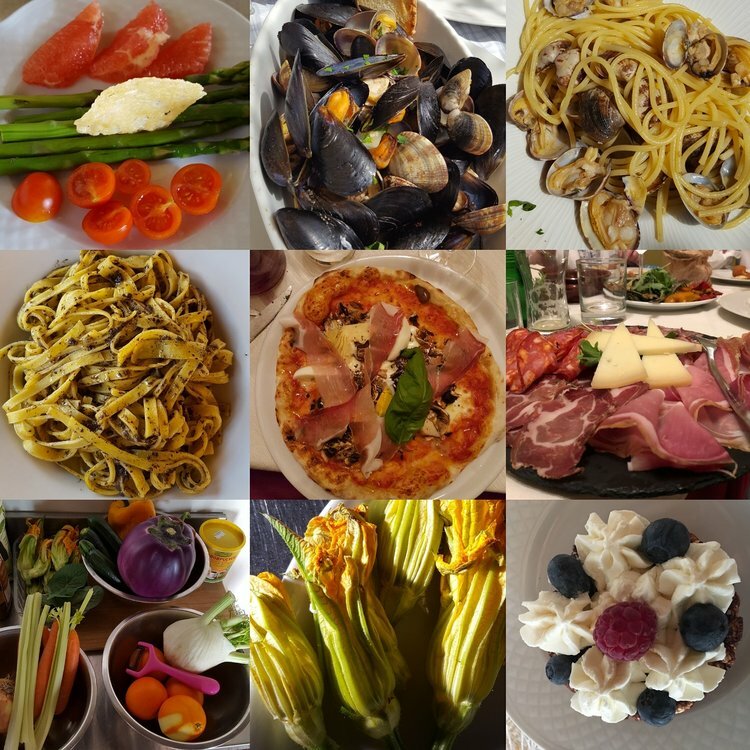 I loved everything about my Italian cooking holiday - except coming home! Every day surpassed the previous one and each day individually was so unique: the location, the locals, the sunshine, the food, the wine. We didn't have a dull moment - of course, with Pauline (Delisha !) that would have been impossible!! We were also so fortunate in the company we had - a motley crew - that gelled from the first night over our Welcome Dinner. So thank you for such brilliant organisation and for ferrying us - without complaint - here, there and everywhere. We were very well looked after. We 100% espect your privacy.